I want to learn to make more cheeses so I decided to try Chevre (pronounced chev) which is a creamy white soft cheese made from goat’s milk. It’s been made in France and Italy for centuries but only since the 1980’s has it become popularized here in the states. 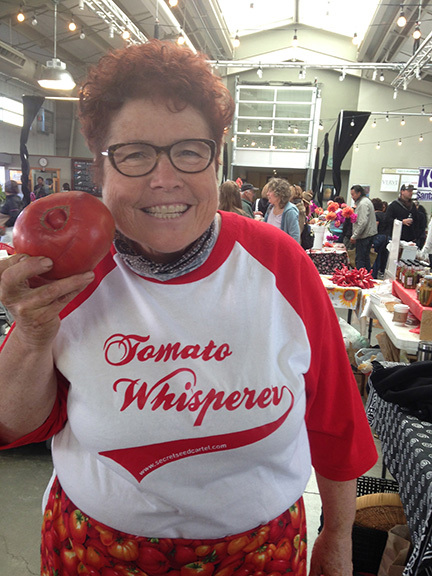 It was introduced by Laura Chenel to Alice Waters of the famous Chez Panisse restaurant. She had a creamy version that became very popular in the restaurant and the rest is history. 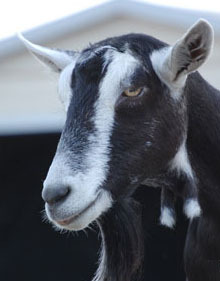 Goat farms sprang up in America and a new era of cheese was introduced. 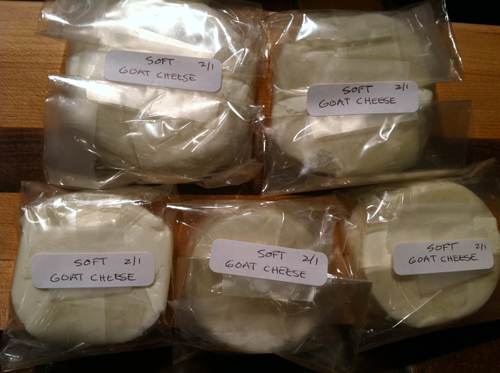 I never use to like goat cheese until I bought some from our local Farmers Market. The ones at the market were so mild. Not that strong ‘goaty’ taste which I later found out comes from what you feed the goats. So here is what I did last week. It was easy and turned out good for my first try. I bought a gallon of whole goats milk and pulled it out of the refrigerator till it was room temperature. I put it in a pot and slowly heated it to 72° in some warm water in the sink. You have to use a thermometer to check the temperature. Here is the thermometer I used but in this picture, it is 180°F because this was when I used it for making the mozarella afterwards. (Again you want it at 72°F for the Chevre). I got my starter, rennet, calcium chloride, cheese thermometer, cheesecloth and molds from www.cheesemaking.com. I stirred in one packet of Chevre starter. Then I put one drop of rennet in 5 tablespoons of water and took 1 tsp of the diluted rennet and mix it well into the milk with an up and down motion. I also added calcium chloride because the milk was store-bought pasteurized milk and sometimes won’t form curds-so this helps. 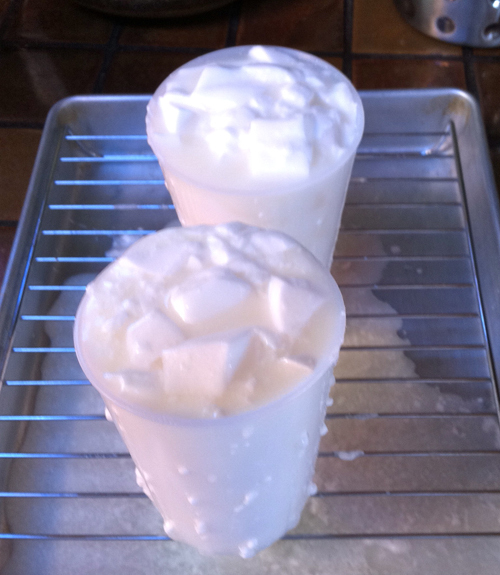 I put 1/8 tsp of calcium chloride into 1/4 cup water and put the whole amount into the milk, stirring well. Then I let it sit out for 12-14 hours at room temp. I covered it after this picture. People think it will spoil but it doesn’t. You want the milk to separate into curds and whey. 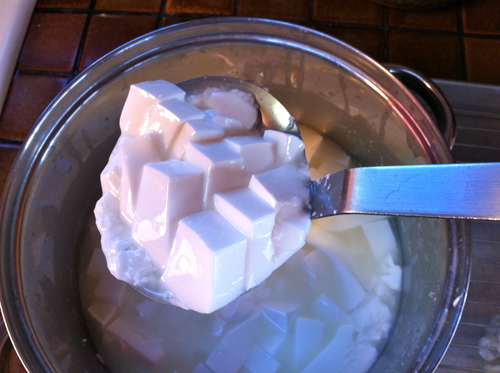 Curds are the butterfat in milk and whey is the liquid which is mostly protein. 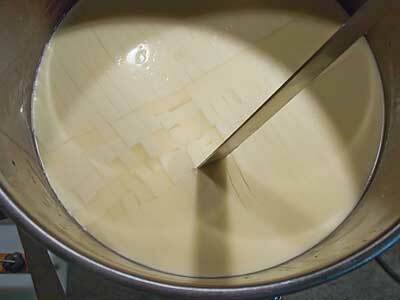 Don’t touch it during this time and it will set up and become firm like very soft tofu with the liquid whey on top. I let it set all night while I slept and in the late morning it was perfect. I then took a knife and cut it one way into 1/2 inch slices and then at a right angle to make 1/2 inch pieces. This releases more whey. Wait about 5 more minutes. Here it is ready to go into some molds. 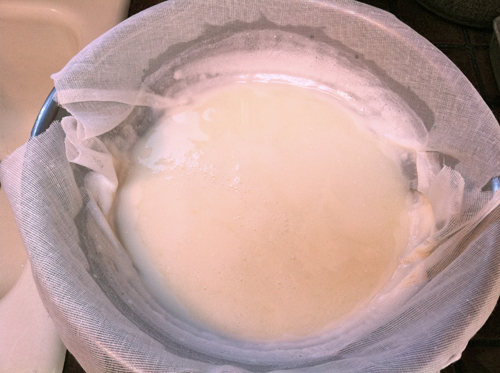 Use a slotted ladle to drain the curds, I put it into molds or superfine cheescloth muslin where it will drain all the whey out. I saved all the whey because you can make ricotta cheese from it but it must be done within 3 hours of first separating it. Here it is 2 hours later. Notice it is draining on a rack over a pan where the whey and a few of the curds come out of holes on the sides of the molds. The one on the left is already more compressed just by letting it drain. In the molds it needs to drain for 2 days on a counter to release all the whey! 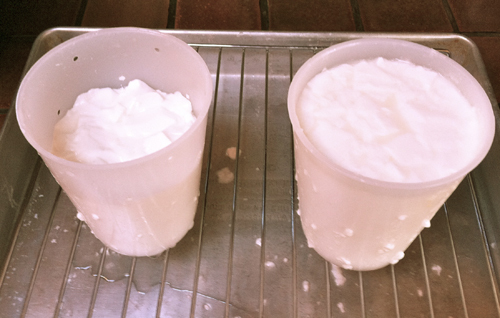 Here is the chevre packaged into servings after the molds. 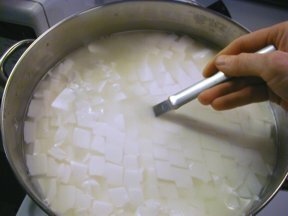 If you choose to drain it in muslin, place the muslin in a colander, over a big bowl and gently scoop out most of the curds and then pour the rest through the muslin. 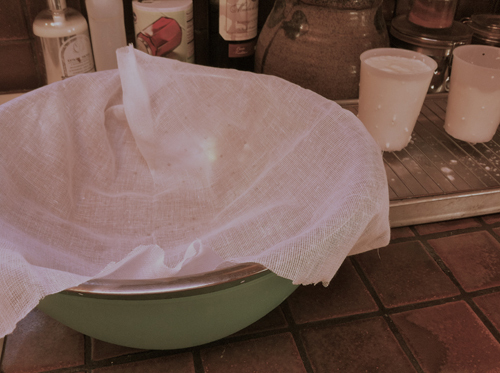 Take the opposite corners of the cheesecloth and tie them and do the same for the other side. Then hang it up on a spoon over a pot to drain the whey. This version will be very spreadable vs the molds which will hold their shape and can be cut into pieces. I had enough to do it both ways. I put the one in the cheesecloth in a container and into the refrigerator. Afterwards I sprinkled a little salt on the surface and refrigerated. You can also roll it in herbs if you like. Yum! 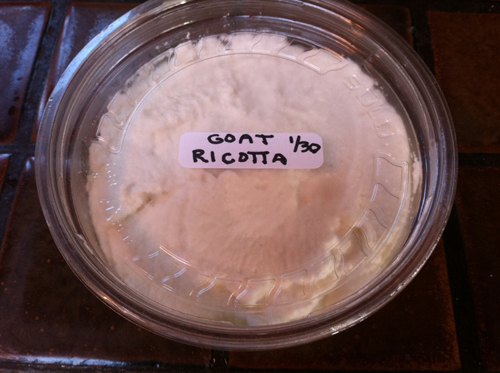 Now here is how to make ricotta cheese from all that leftover whey. It’s super easy. Heat the whey on the stove till it foams which is almost boiling but not quite. Do not let it boil. Here is that picture with the thermometer again. 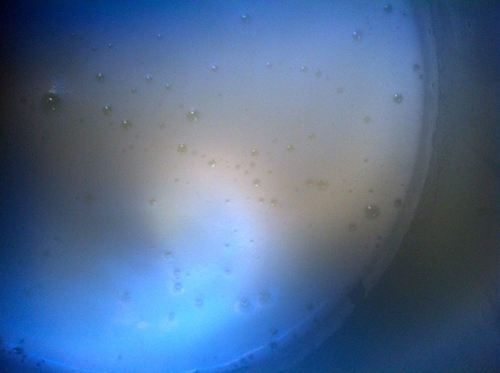 This time the temp got up to about 187°F although here is about 180°F .This separates the superfine particles of curds which aren’t captured the first time when I made the chevre. Here is a closeup of the foam. Skim off the foam and discard. 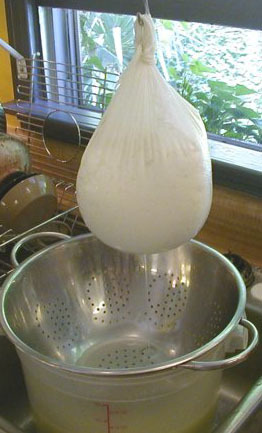 Pour the whey through the superfine cheesecloth and let the curds drain for 15 minutes. 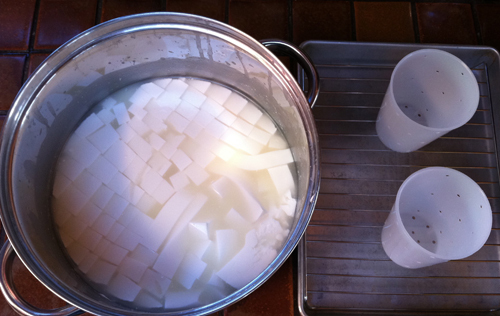 Then scrape the curds off the cheesecloth and put them in a container. You’ll get much less than when you first get the curds for the Chevre but this is also very good. Now you have 2 cheeses! Now there still will be lots of leftover whey which I give to the chickens. They love it and it’s really good for them. I make feta to go with my tomatoes from the garden. So how do you make feta? First you need to get some milk! I went to our farmers market on Saturday and got an 1/2 gallon of goat milk from South Mountain Dairy, a local dairy farm. I wanted to make goat feta. (Actually I would love to make sheep feta but I don’t know of any sheep farmers in this area-this is Baaad!). 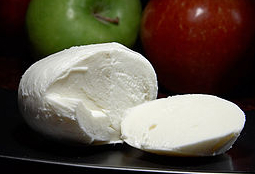 Sheep or goat’s milk is used in traditional feta although cow’s milk is used now too. Sheep’s milk has the highest fat content, then goat’s milk and last cow’s milk. If you haven’t had sheep feta or any cheese made with sheep’s milk, do try some. It will be the smoothest, creamiest, most flavorful cheese you will ever taste. 1. Put your milk in a pan and stir diluted lipase in it. 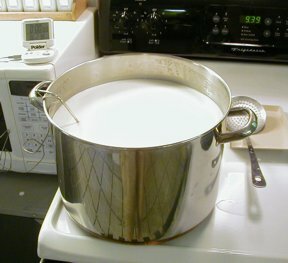 Heat the milk to 86°F (It doesn’t take but a couple of minutes). 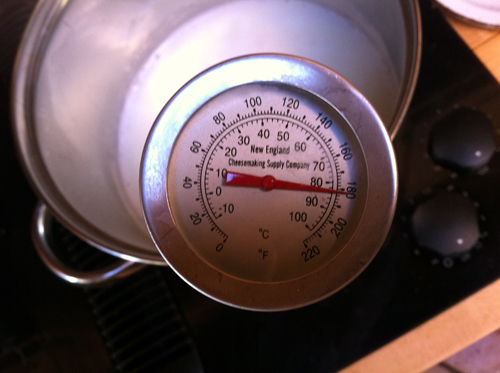 Use a thermometer for cooking. Add the starter (1 packet of mesophilic starter) in it and stir. Cover it and keep it at 86° for one hour for the milk to ripen. 2. Put 1/8 teaspoon of rennet in about 1/8 of a cup of water. Put the diluted rennet into the milk, stirring for several minutes. cover and let set at 86°F for one hour. 3. After the one hour, it should be set firm. 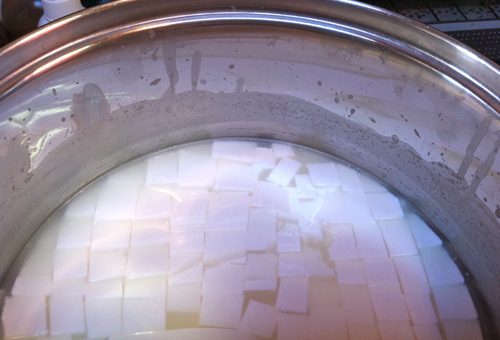 Cut the curd into 1/2 inch squares while in pan. Cut across from the first cuts to make squares. Let sit 20 minutes. More whey liquid will be released. 4. 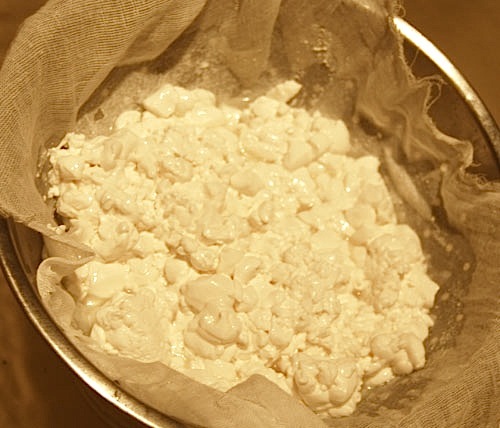 Keep at 86°F and gently stir the curds for 20 minutes. This releases more whey and firms up the curds. 5. Pour the curds into a colander lined with butter muslin (you can get it here) which is finer than regular muslin. 7. Untie the bag and remove muslin. 8. 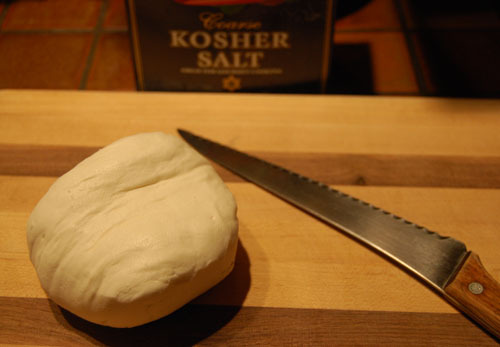 Cut the curds into 1 inch slices. 9. 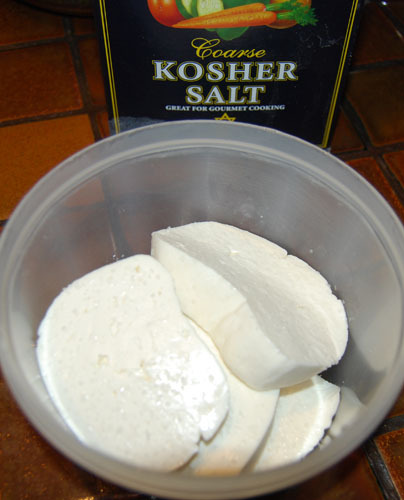 Sprinkle with kosher salt and put in a airtight container and age for 4-5 days in the refrigerator. More whey will be released and the slices will get firmer (so you can crumble it later). 7. Put it in a airtight container and put in refrigerator for 4-5 days. Store in the refrigerator. Rinse before use to remove excess salt. 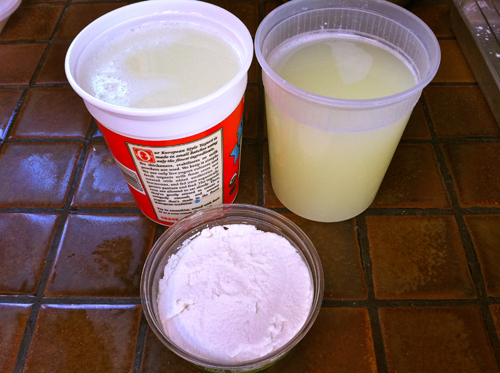 For a stronger flavor, make a brine solution by combining 1/3 cup salt and 1/2 gal of water. 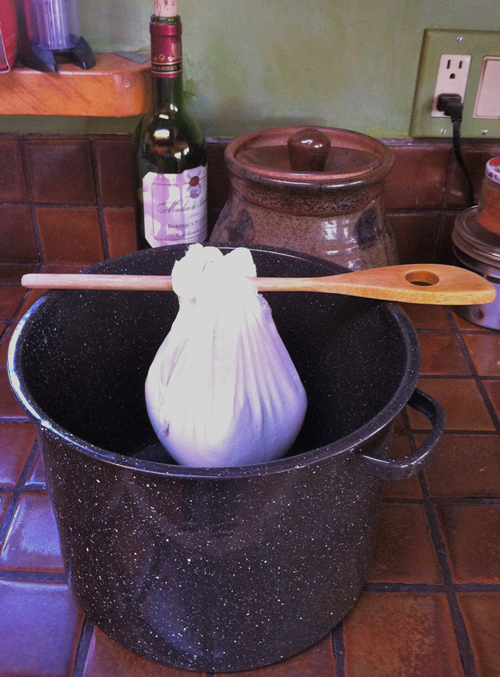 Place rinsed cheese in the brine and store in refrigerator for 30 days. 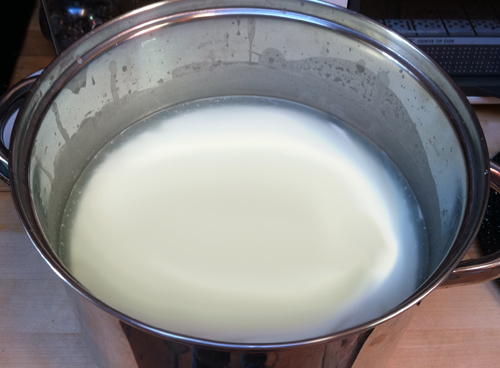 (Use the brine solution for farm bought milk only, store bought tends to disintegrate in brine). Afterwards, I took the remaining whey and made ricotta from it. I took the whey and put it in a pot and reheated it to just below boiling so it released more protein. You can see the little particles separate from the liquid. I took that mixture and strained it in another muslin lined colander and let it drip for 15 minutes. Then I put it in a container and put it into the refrigerator. That’s it. You really don’t get much ricotta but you’re not wasting the whey either. The rest of the whey I will give to the chickens and later to some plants. Two cheeses in one day! GOAT=(cheese) + TOMATO = YUM!!! Yesterday I made Feta cheese for the first time! Why am I putting it in a gardening blog? Tomatoes! 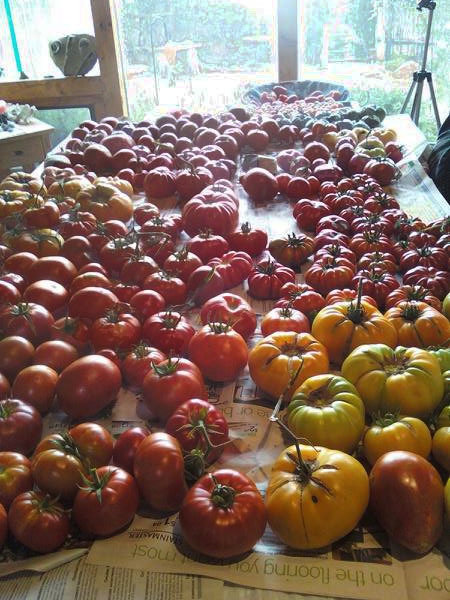 I’m learning now so I can make some in TOMATO SEASON! I already learned Mozzarella last year and wanted to learn how to make Feta too as I like both these cheeses with tomatoes in the summer. I make a traditional Italian Caprese salad with fresh mozzarella, tomatoes and basil with a balsalmic vingerette. The other salad I call a ‘Greek’ Caprese because I use crumbled feta cheese instead of mozzarella, and the rest of the ingredients the same. I like the saltiness of the feta with the tomatoes. In my next post I will show you how.